Silence is the first casualty. you are alive and someone else is dying. that wants to live in spite of this. the brow of a blood-red moon. that prepare to salvage, to heal. the same legends we do about brown bodies. what we, with our infinite silences, make possible. 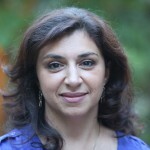 Lena Khalaf Tuffaha is an American poet of Palestinian, Syrian, and Jordanian heritage. Her poems have been published or are forthcoming from journals including Blackbird, Borderlands Texas Review, Lunch Ticket, Indianola Review, Sukoon, Mizna and the Ofi Press Mexico. Two of her poems have been nominated for the 2016 Pushcart Prize. Her first book of poems, Water & Salt, is forthcoming from Red Hen Press in 2017. She lives in Redmond, Washington with her family and studies Poetry at the Rainier Writing Workshop at Pacific Lutheran University.